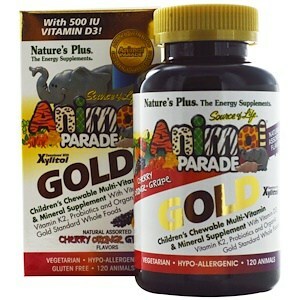 Animal Parade Gold Sugar-Free Children’s Chewable Multi Vitamin takes this best-selling multi-vitamin and mineral formula to the next level! Bursting with irresistibly delicious, natural cherry, orange and grape flavors, each serving of these fun, animal-shaped chewable is now packed with 500 IU of vitamin D3, more trace minerals, enzymes, probiotics, and a colorful assortment of organic whole foods. With 500 IU Vitamin D3! As a dietary supplement for children, chew two tablets once daily. Designed for children of safe chewing age and older. Xylitol, natural color, citric acid, guar gum, natural cherry, orange and grape flavors, magnesium stearate. Certified Organic Gold Standard Whole Food Blend (organic acerola extract, apple fruit, broccoli sprout, cauliflower sprout, collard, cordyceps mushroom mycelia, kale, kale sprout, maitake mushroom mycelia, nettle, parsley, pure beet juice, pure carrot juice, pure spirulina, reishi mushroom mycelia, shiitake mushroom mycelia, spinach, tomato juice, wild bilberry, wild blueberry, wild lingonberry; pure chlorella), rose hips (Rosa canina fruit), whole brown rice, broccoli, spinach, mango fruit, carrot, West Indian cherry (malpighia glabra fruit), papaya fruit. 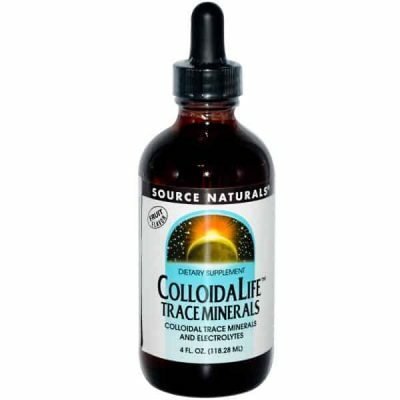 Mineral aminoates are whole brown rice chelates. Free from artificial colors, preservatives, and the common allergens yeast, wheat and soy. Sweetened with xylitol, which may reduce the risk of tooth decay.